The Waharoa ki te Toi Health Research Centre at Kaitaia Hospital, a partnership between The Moko Foundation and the Maurice Wilkins Centre, opened on Friday 17 August. The official opening of Kaitaia's Waharoa ki te Toi Health Research Centre formalises a partnership almost a year in the making. The centre has already commenced testing of patients as part of the nationwide CREBRF Study, the first of its kind, looking for potential links between peoples’ genetics and their risk of developing metabolic diseases such as diabetes and heart disease. It will also be investigating drivers of obesity in children. 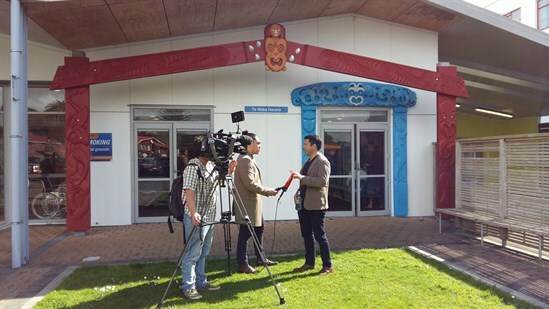 Media interviewing Dr Lance O'Sullivan, Founder and Chairman of The Moko Foundation, prior to the centre's opening. 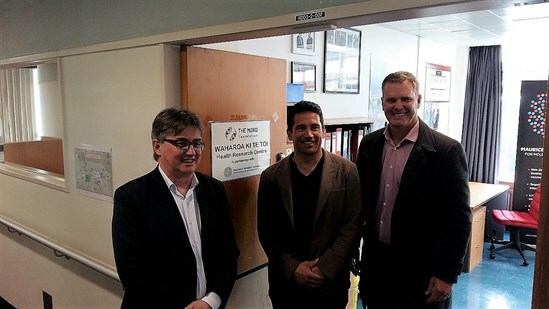 “We are excited to have partnered with the Maurice Wilkins Centre to bring this opportunity to Te Hiku and it is the start of a number of projects we aim to see being delivered out of Kaitaia,” said Dr Lance O’Sullivan, Founder and Chairman of The Moko Foundation. Waharoa ki te Toi was successful in gaining $500,000 of funding to establish and deliver a genetic programme run by and for the people of Kaitaia. The health issues that are being investigated cause significant health problems for communities such as Kaitaia, so the new centre is being seen as an opportunity to address these. L-r: Professor Peter Shepherd, Maurice Wilkins Centre Deputy Director, Dr Lance O'Sullivan, Founder and Chairman of The Moko Foundation, and Mr Matt King, MP for Northland, pose for a photograph following the official opening. Newly announced Clinical Director of the Waharoa ki te Toi, Dr Joel Pirini, a local Māori Northland DHB doctor (Te Uri o Tai-Pawarenga) also employed by The Moko Foundation, said he is particularly excited about the application of this form of research to the local community. He also revealed that The Moko Foundation is proud to announce that recently knighted and respected kaumatua Sir Hekenukumai Puhipi is the patron of Waharoa ki te Toi. For more highlights from the Centre's opening, please check out Māori Televsion's comprehensive coverage.